How to embed Teamup Calendars into Web sites and Facebook pages. 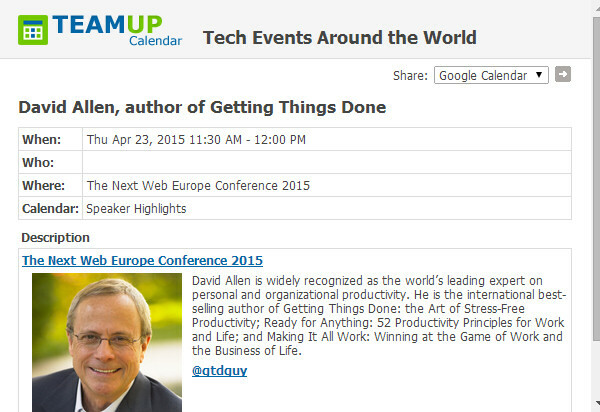 Publicize your events by sharing your Teamup Calendar online. Teamup Calendars can be embedded into a web page or added to a Facebook page with ease. In doing so you can control exactly how your calendar looks in each place and the level of access that your viewers have to your calendar. When sharing your calendar online be aware that you are giving others access to the calendar’s contents. In most cases you’ll want to share a read only link to the calendar so viewers can see the calendar but not make changes to it. In some situations, such as sharing a calendar in a closed Facebook group, you may wish to allow more freedom to interact with the calendar because you know and trust the viewers, but this won’t be the typical scenario. When the calendar administrator (or another user using a calendar link with the modifier right) makes changes or adds new events to the calendar these will automatically reflected on every shared version of the calendar so they are all updated immediately and without any further work. The goal is to make it easy for people to access the calendar without having to type or bookmark a URL like this (it is so for security reasons), and better still, is being able to share the calendar itself in places where people interested in your events can be found. If you use Facebook, you can embed your calendars inside Facebook profiles, you can add them to your Facebook page and also to a Facebook Group. 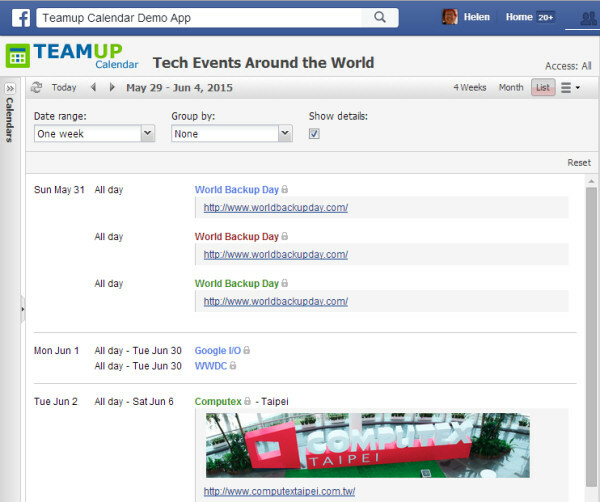 Learn to use Teamup Calendars inside your Facebook profile. Learn to add a Teamup Calendar to your Facebook page. If you are a member of a Facebook Group you can share your Teamup Calendar to your Facebook Group by posting it to your Status. Learn how to share a Teamup calendar to a Facebook Group. When embedding the calendar this way you can use additional parameters to control how the calendar looks. So you can specify the initial view and the calendar starting date, for example. Unlike other calendars, Teamup Calendar allows single event to be displayed and shared as a web page, which can be shared independently or embedded into any website as you would do with any other page. This could be useful, for example, a speaker may like to embed only his session, without the entire calendar, into his own website; or you are promoting a specific fund-raising event to a targeted community without sharing other events targeted to different communities. Learn how to share calendar events as Webpages.